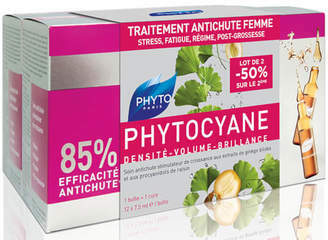 Combat thinning and acute hair loss locks with botanical-powered haircare brand Phytoâ€™s Phytocyane Treatment Duo Pack ; a powerful, triple action scalp serum that promotes fuller, thicker hair as it grows whilst delivering exceptional cosmetic and anti-aging benefits. Combining sulphured amino acids, B vitamins, and Silk proteins to encourage keratin production at the follicle level and improve thickness of the hair, the advanced densifying treatment supports scalp micro-circulation to create an optimal environment for healthy hair growth. Each use creates thickness on every strand, maximises fullness, enhances shine and even helps to keep grey at bay. Hair looks more voluminous and lustrous after just one application.